although kerosene is offering a cleaner and tidier version, maybe you should contact him too. What happened with the glass in the right side? It happened to me too. Was those polys fliped? I will check mine. Thanks. I have no idea what is going on with the glass on the right side. As far as I tell the polys are fine. I flipped them once and it had no affect. If you figure out what the problem is, let me know. Here is my latest render. it’s always nice to see c4diers (& old schoolers) in these challenges! looking good already, expept for the foreground part, in the stairs. they are a bit underexposed. perhaps you could add a fill light in front of the camera, or add a specular only light in the main exhibit area pointing at the camera and define the shapes more clearly. Thanks George, will do. I’ve added some fill from the windows behind the camera, will post it. I really like nehak’s version too. Very nice halo lighting and marble floor. The ceiling artwork is amazing! I do think the banister railing marble texture is a bit too much marble and may not fit well in the scene. And the marble on the floor I think needs some tiling to break it up a bit and make it more realistic. Maybe make larger marble tiles with different orientations. This is the first render. I need to do more work on textures. Really nice first try and it looks like its almost finished. What did you use to render and light with? I added some fill light for the stairs in the foreground. Since everything’s set up already, I did a rendering with FinalRender2 as well for comparison. The top image is all hand lit, while the bottom one uses GI. There are things I like and dislike about each image, but the challenge was fun. Top image is mostly area lights. It only takes about 5 minutes to render when I use shadow mapped shadows, but when I turn on Area Shadows for the area lights, the render time jumps to 4 hours! The finalrender2 scene only took about 10 minutes to set up, using a physical sky for the scene. It renders in about 45 minutes. Cinema 4D used for both. The GI scene was a lot easier and faster to set up, but I learned more doing the first scene and placing all the lights! For this scene I used 3Ds Max 2009, Mental Ray and Global Illumination. I set up area lights on the windows, a directional light and 4 point lights in the center of the building just for fill and bounce, the rest was taking care bye the FG. Hello, thanks for the comments Jeremy, I hope you like the progress on my image. I use some rimlight_shader from the autodesk area for the dynosaurs, and more detail in glasses and textures. I need 5 pasess for the final composite, a beauty pass, oclussion, two volume lights and a glow for the back windows. I really like the color/texture variation in your floor tile, also nice choice rotating the triceratops to make for a more interesting silhouette. The t-rex shadow seems dense or muddier looking than I would expect it to be, especially because I am not seeing much of a contact shadow for the tri. 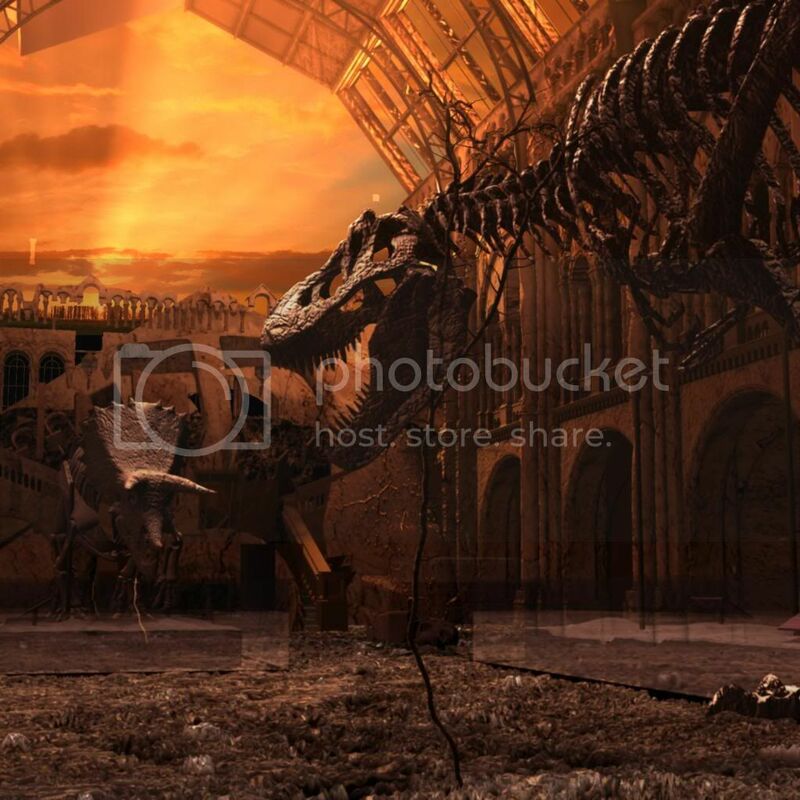 I like the harmony in color choice of the structural arches towards the ceiling and the dinosaur bones. It definitely draws attention to the parallels in their skeletal forms . . . the arches acting as a rib cage to the central spine of the building. Nice work. Hello everyone, thanks for your comments. Here’s my update. And my Vray settings, may be someone will find them useful.